There are two extremes we can go to when it comes to evaluating something. We can analyze it to death and get so unhealthy because we can’t get anything done because we are constantly taking our temperature. Or we can fail to ever evaluate anything and over time those things lose their effectiveness because they are happening just because they always have.In many churches the Bible classes do not suffer from over analysis. Many are sick and dying because they have lost their way. What ends up happening is we scramble to find X number of teachers to fill X number of classes. We are happy with whatever the volunteer teachers want to teach so long as the class continues uninterrupted quarter to quarter. We call that a win but is it? We lack consistency in the quality of teaching due to desperation to fill slots, often at the last minutes. We don’t have an overarching vision of the purpose or direction for what we the classes should be accomplishing. What is more, I believe we have come to the conclusion that as long as something is being studied and some people show up that equals success. Can anyone else relate with this? I am going to take a few posts to lay out some ways to assess what we are doing with our Bible classes and explore how we can make them better, more purposeful, and transformational. As always, any input you guys have along the way is appreciated. I will watch the coming posts with interest. I also, like you, think we drift in our Bible class programming. Just as many preachers do impulse preaching – with little to no planning beyond each individual lesson, too many classes are going nowhere because they have no vision of where they ought to be going. Thanks for taking a look at this issue. I’m interested in seeing your posts. 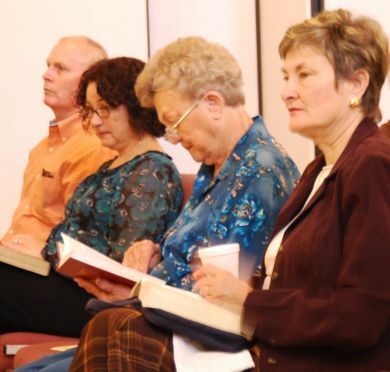 We forget that usually our guests’ first impression of our congregation is usually inside our bible classes. Matthew…thanks for stopping by. Looks like you have uploaded quite a few resources to your own site. I always love to see people do that! Four things that might help deepen and strengthen a bible program. One pick your best teacher(s) and have them mentor new teachers. Very Important. Two, offer teacher training in bits and sections. Dr. Houston Heflin from ACU has a great podcast that is only 7-9 minutes long each time on teaching. The biggest challenge is to fill slots. This term we didn’t have a class because we couldn’t find good teachers. But the other classes were great. I have inherited a great bible class program and am very blessed! Thanks for sharing those points. Houston is a very gifted man and a friend of mine. I am blessed to know him. I think one thing that needs to be said up front that I will mention in my next post is that there is no perfect cookie cutter approach that is “one size fits all” perfect for every context. But we can take good principles and apply them to our own context and adapt them into something that works. I for one, have always been an explorer when it comes to Bible knowledge and all things Christ. Wouldn’t you love to see a Bible class taught as it truly should be, as an ancient text found in a cave from the east. Everybody finding out again together, bit by bit and piece by piece, just who wrote it and how powerful it is for our selves, without some know-it all preacher spoon feeding us like baby birds as to how it should sound, taste and smell. When it is done in the regular fashion, it always comes out sounding southern, like some Kentucky fried picnic, instead of ancient truth rediscovered in a cave, to save all mankind from the lostness of modern culture and death.